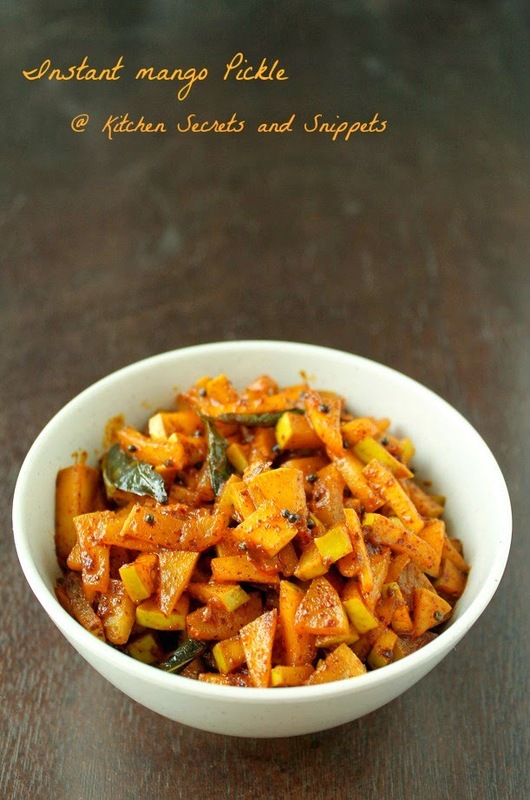 Instant mango pickle : Who likes mango? me me me..Yes, I love mango to the extreme, be it raw or fruit ,just love them so much. I think most of the ladies out there are with me, don't know in my family nobody likes it except me..weird. Well, today's post is just a humble mango oorgai which can be done in nearly 10 minutes with simple spices called the pickle spices. I know most of us know how to make this still this entry is for those who knows no clue regarding this. Let's get going..
Clean the mangoes thoroughly and chop them into small pieces or according to ur need. Add the salt along with the chopped mangoes and give them a toss. Cover and keep for 10 minutes. Next dry roast the given ingredients like dry red chillies, fenugreek seeds, mustard seeds one by one on a medium flame without burning the fenugreek seeds. Let it rest for a couple of minutes and grind them to a coarse powder. Heat 1/3 cup of oil, fry the mustard seeds until it stops popping. Turn the flame to low .Throw in the curry leaves next followed by turmeric powder, red chilli powder and the ground masala powder. Quickly mix the masala for few seconds and dump in the prepared mango pieces. Switch off the gas stove. Now slowly mix the mangoes with the masala mix. Do not cover the pan. Let it sit in the residual heat until it cools down. Transfer them to a bottle and store. Heat 1/3 cup of oil, fry the mustard seeds until it stops popping. Turn the flame to low .Throw in the curry leaves next followed by turmeric powder, red chilli powder and the ground masala powder. Quickly mix the masala for few seconds and dump in the prepared mango pieces. Switch off the gas stove. Now slowly mix the mangoes with the masala mix. Do not cover the pan. Let it sit in the residual heat until it cools down. Transfer them to a bottle and store. 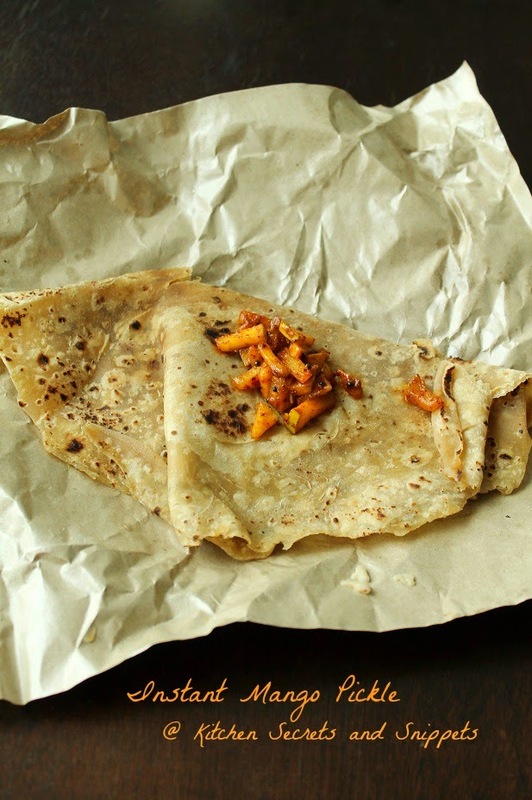 Serve with rice or roti's. delicious finger licking mango pickle.